A tunnel diode is a high conductivity two terminal P-N Junction diode doped heavily about 1000 times higher than a conventional junction diode. Tunnel diodes are useful in many circuit applications in microwave amplification, microwave oscillation and binary memory. According to classical mechanics theory, a particle must have an energy at least equal to the the height of a potential-energy barrier if it has to move from one side of the barrier to the other. In other words, energy has to be supplied from some external source so that the electrons on N side of junction climb over the junction barrier to reach the P-side. However if the barrier is thin such as in tunnel diode ,the Schrodinger equation(Quantum Mechanics) indicates that there is a large probability that an electron will penetrate through the barrier. This will happen without any loss of energy on the part of electron. This quantum mechanical behavior is referred to as tunneling and the high-impurity P-N junction devices are called tunnel-diodes. The tunneling phenomenon is a majority carrier effect. Tunnel diodes are usually fabricated from germanium, gallium or gallium arsenide. These all have small forbidden energy gaps and high ion motilities. Silicon is not used in the fabrication of tunnel diodes due to low (Ip,I v)value. A small tin dot is soldered or alloyed to a heavily doped pellet of n-type Ge, GaSb or GaAs. The pellet is then soldered to anode which is also used for heat dissipation. 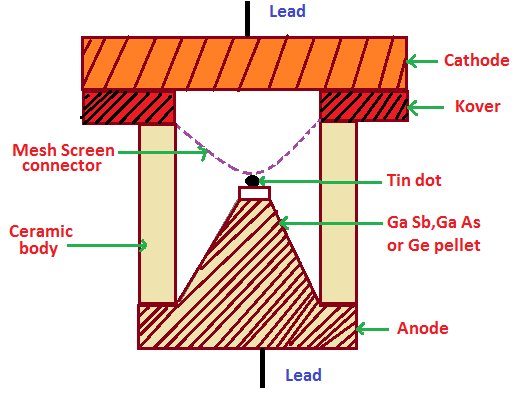 The cathode contact is connected to the tin dot via a mesh screen used to reduce inductance. The diode has a ceramic body and a hermetically sealing lid on top.